Defined Details - 9 Awesome Beach Wedding Ideas! beach |bēCH| noun. 1. a pebbly or sandy shore by where the ocean meets the land and is marked by high and low tides. 2. beaches typically occur in areas along the coast where wave or currents hit and change the land. he married his love on the beach as the water kissed their toes. If you’ve noticed that I have a special affinity towards beach weddings… it’s because I was married in the sand, on the beach in Santa Catalina Island. I am a beach girl through and through, I live by it, I prefer to be surrounded by elements from it and I don’t like going one day without seeing it. One of my most favorite sights is a gorgeously styled beach wedding… no cheesy starfish and dolphins… I’m enthralled with natural colors, rustic styles and minimal “beach” elements. 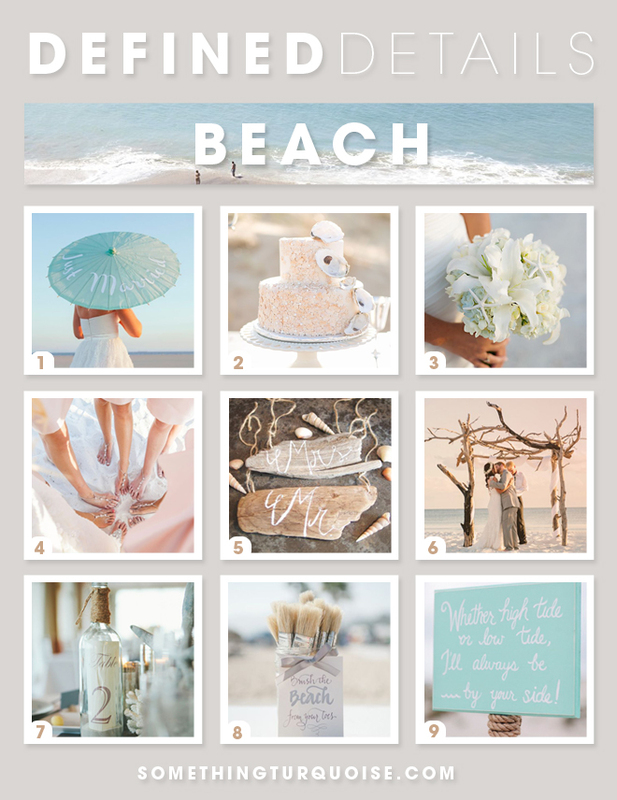 In the celebration of the summer season, here are 9 of my favorite beachy wedding ideas from around the web. DIY Wedding Parasols: Something Turquoise. Parasols are a wonderful detail for any outdoor event as they are just as darling as they are useful. If you’re spending time outdoors during the day for your wedding, it’s a wonderful idea to provide a few parasols for those who would like to stay out of the sun – like your grandmother. This image is from one of my DIY tutorials where I show you how you can personalize parasols for your event. Wedding Cake With Oysters: Amanda Hedgepeth Photography via Glamor & Grace. Beautiful oyster shells are a wonderful idea for beach wedding cake decoration. Their organic coloring and pearlescent sheen are sure to add a romantic element to your decor without being over the top beachy. Beach Wedding Bouquet: Karen Harrison Photography via Style Me Pretty. The lovely ruffled texture of the stargazer lily petals sits perfectly atop the soft blue hydrangeas and the addition of just a few bright white starfish adds the ideal amount of “beach” to this bouquet. You can wire wrap a few small starfish (or have your florist do it) for this same, natural look. Beach Feet “Necklaces”: Maria Angela via Something Turquoise. Many beach brides opt for “feet necklaces” opposed to shoes for themselves and their bridesmaids. A beautiful way to dress up your toes… and makes for darling pictures. They can easily be traded for real shoes once your time on the sand comes to an end. Mr & Mrs Driftwood Signs: Fir + Forest via Etsy. Reception chair signs are all the rage, so bring the beach to yours no matter if they are outdoors or in. Fir + Forest will customize driftwood signs specifically for your special day, and beautiful signs like these are sure to find a place in your home after your event. Driftwood Ceremony Arch: Hello Miss Lovely via Ruffled. Saying “I Do” on the beach at sunset has to be the most romantic place to become husband and wife. This couple said their vows under the most amazing driftwood ceremony arch I’ve ever seen. Gather your own driftwood during the months leading up to your event to add to an existing arch or if you or your fiancé are ultra handy, maybe you can make your own. Message In A Bottle Table Numbers: Monika Gauthier Photography & Design via Style Me Pretty. I’ve always hoped to discover a message in a bottle washed up on shore… let you guests discover their tables with adorable message in a bottle style table numbers! Add sand to your bottles, print numbers on cream colored paper (and distress if you’d like), then roll and insert into the bottle. Wrap the bottle top with rustic rope and you’re afloat! Brush The Beach From Your Toes: Heather Kincaid via Style Me Pretty. 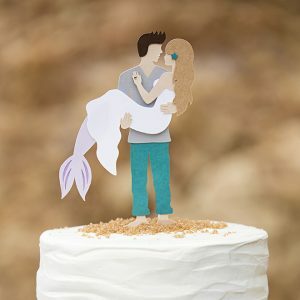 One of my most favorite beach wedding ideas! 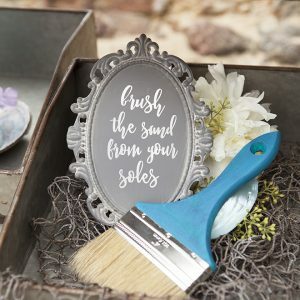 Providing a few large, soft bristled paint brushes for your guests to brush sand off their bare feet is such a lovely treat. If you’ve ever walked in the sand and then had to put your shoes on, let alone dress shoes, you know that this will be a much appreciated detail at your sandy event. High Tide or Low Tide, Wedding Sign: Something Turquoise. I painted this lovely little sign as part of a special, beach styled bridal shower I created for Martha Stewart Celebrations. Whether high tide or low tide, I’ll always be by your side… the perfect saying for a seaside event. 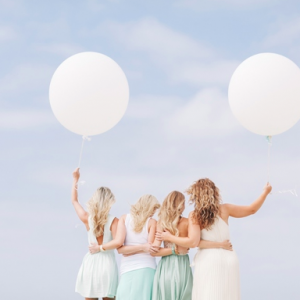 If you are a beach loving bride, you’ll fall in love with this shoot!